Another September. I'm glad to see August go. August had some not great moments. I'm hoping September will be better. I'm looking forward to Pumpkin Spiced Everything. I already had a Pumpkin Spice Latte from Starbucks. I can cross that off my Autumn To Do list. I love Fall so much! The weather is getting cooler and I can smell that rotten leaves scent it the air already. Can't wait to wear my flannel and high boots. Yes, I'm that girl. I don't care! My vegetable garden is almost done. I have some tomatoes left. It's been a great year for tomatoes. I had a ton! Usually I get a few, enough for a salad, but this year was a bumper crop. I'm employed again. I have somewhere to go everyday and I'll get paid to be there. I'm grateful for that. It might mean less time for reading, but I'll make the time anyway. I'm reading All The Things We Leave Behind by Riel Nason. It's pretty good so far. It's very summery so I hope to finish it soon so I can start on my RIP Challenge books. I'm looking for "happy" witch books this year. Books with witches and maybe not a lot of death. Those are hard to come by. I finished Stranger Things last night. What a spooky show. I'm amazed by what Netflix can do. That's the latest from me. How is your September going so far? Yay for a paying job! The tomato crop here wasn't very good - I've been told it was too hot and dry. I hate to see summer go. I hope they all turn red before the frost comes. I love your picture collage! September's not my favorite month, but it's better than February. Our Starbucks is new so this will be my first in a long time. Yay for fall!!! I am loving that cross-stitch pattern for autumn. I'm wondering how long it would take me to finish if I actually started it. 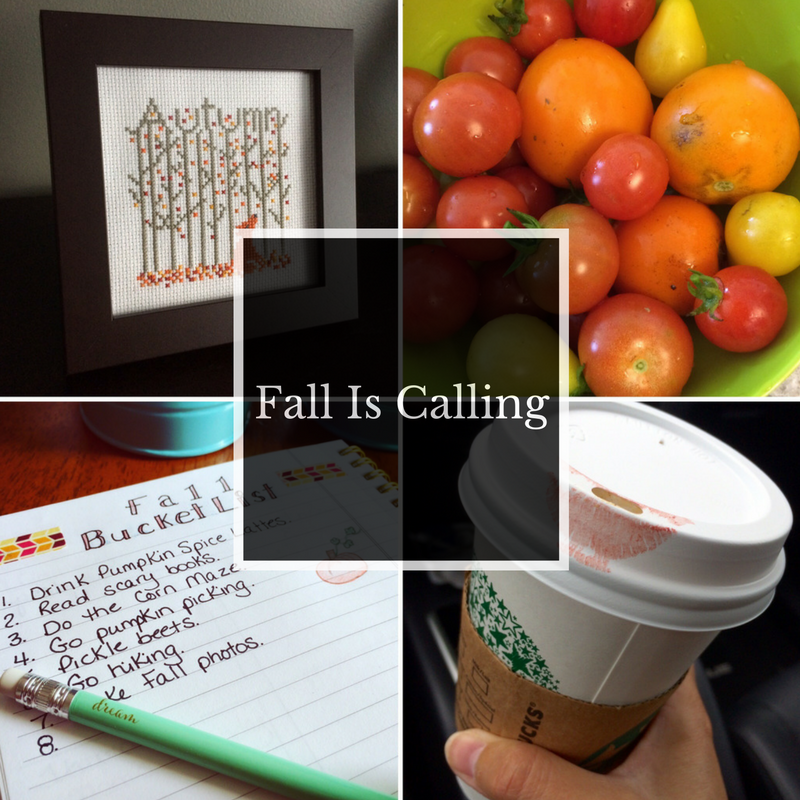 I've already had two PSLs this month and have my boots and flannels all lined up ready to go! Come on cooler weather! I have not been a fan of the PSL since Starbucks changed their syrups three years ago! However, I did see a Chile Mocha in the lineup that I may try. I am thinking fall here too but it got warm again. Drats. That ruins my fall way of thinking. I had no idea they changed the syrup! I saw that Chile Mocha too. I'll have to try that one.